The Dubplate Soundsystem No. 70 – 08.25.18 – Radio for the People, by the People. Tonight on the DUBPLATE SOUNDSYSTEM we’ll feature another episode of FEEL GOOD RADIO with our in-house spiritual advisor, MISS GINA – EMPRESS of LIGHT and POSITIVITY. We’ll also be joined by ROB BEAL from SAN FRANCISCO SUICIDE PREVENTION. A dear friend of the show and your HUMBLE SELEKTAH, he’ll fill us in on some of the services offered by SFSP and shed some light on a topic not often discussed. 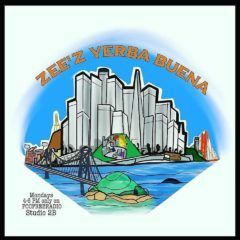 AND, if we’re lucky enough to be graced by his presence, ZEE of ZEE’Z YERBA BUENA will join us as well. Truly one of your HUMBLE SELEKTAH’s favorite people, his comedic genius and lighthearted nature are always welcomed in STUDIO 1A. His fine program can be found right here in on www.fccfreeradio.com every Monday from 4pm to 6pm in STUDIO 2B. Of course, your HUMBLE SELEKTAH assembled a list of hits that would be difficult to find on any other 2hr broadcast. Along with some love and respect shown for the QUEEN of SOUL – ARETHA FRANKLIN, we’ll feature JIM CROCE, BARRINGTON LEVY, EDDIE MONEY, JOURNEY, BOB MARLEY, KYUSS and MANY MORE!! 3 Responses to "The Dubplate Soundsystem No. 70 – 08.25.18"
A great discussion and great music. Local guests for discussion is great every once and while. Excellent feedback Alaceo, thanks for your support.